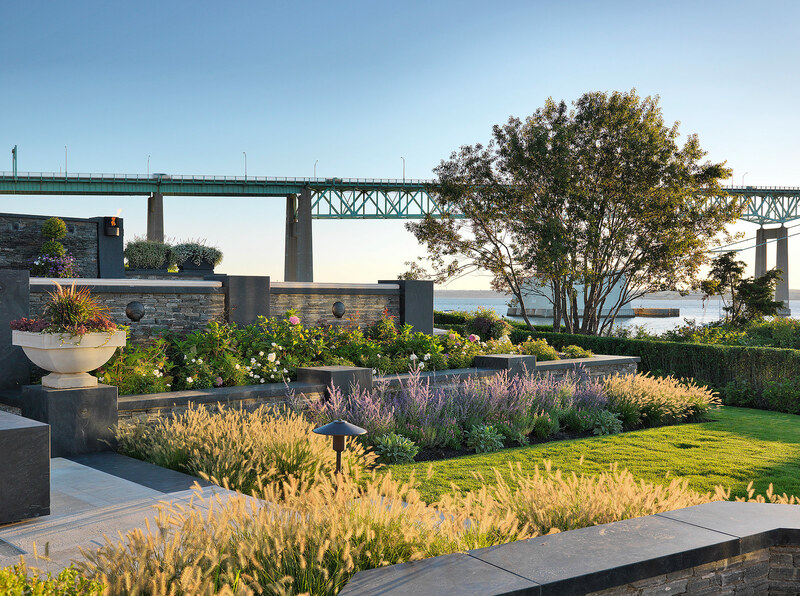 Bridge View blends well-appointed landscape design with the magnificent view of the adjacent bridge and bay. The project was conceived and constructed in phases, with the most recent work completed in the spring of 2018. The site slopes from west to east, where it abuts the shoreline of a large salt water bay. 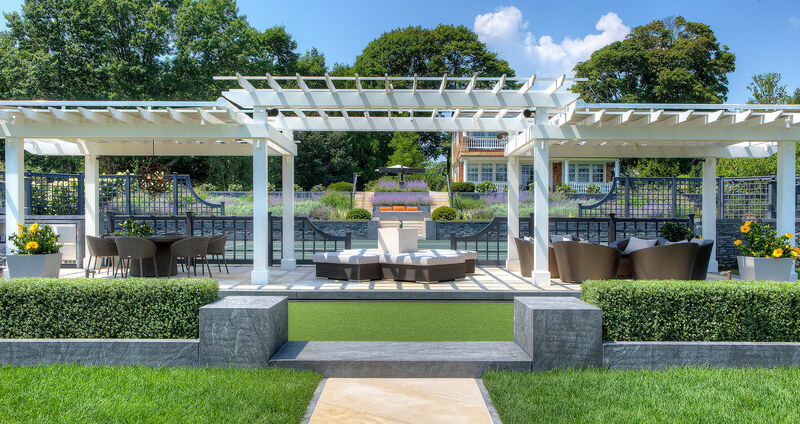 The project scope included terracing, pool and spa, pool house siting, coastal buffer maintenance and planting, driveway and motor court, garage relocation and new guest house siting, and a sports area containing tennis and bocce courts. 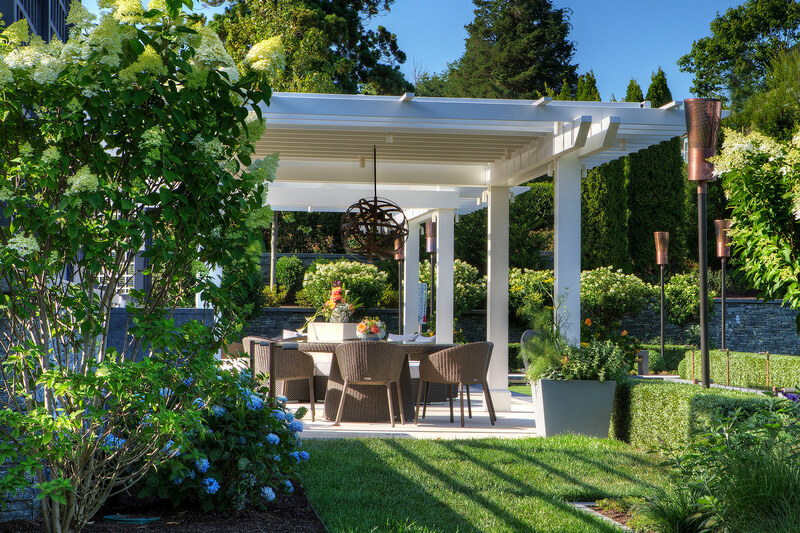 Planting and pots, irrigation, lighting, a custom pergola and fountains were also included in the design scope. 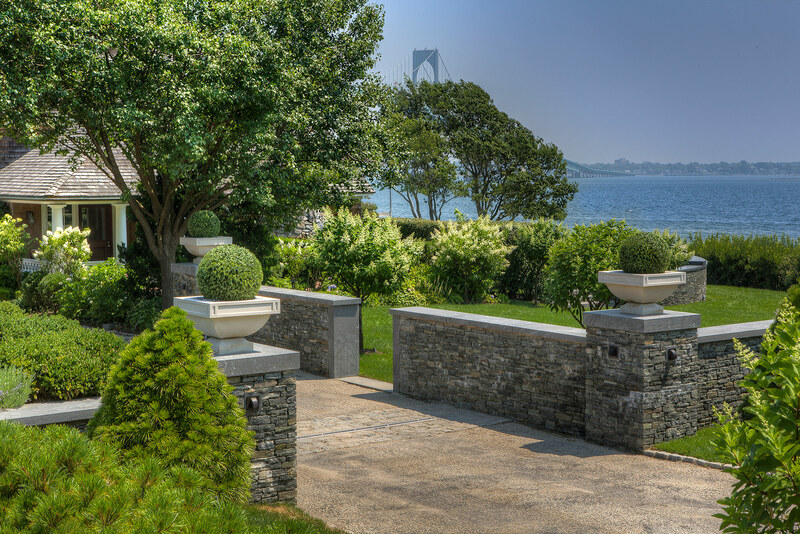 Through the combination of hardscape and plantings, the design reflects the strength that comes from the architecture of the bridge and the scale of the shoreline sky. The result is a bold, sophisticated resort experience in an unmatched coastal setting. 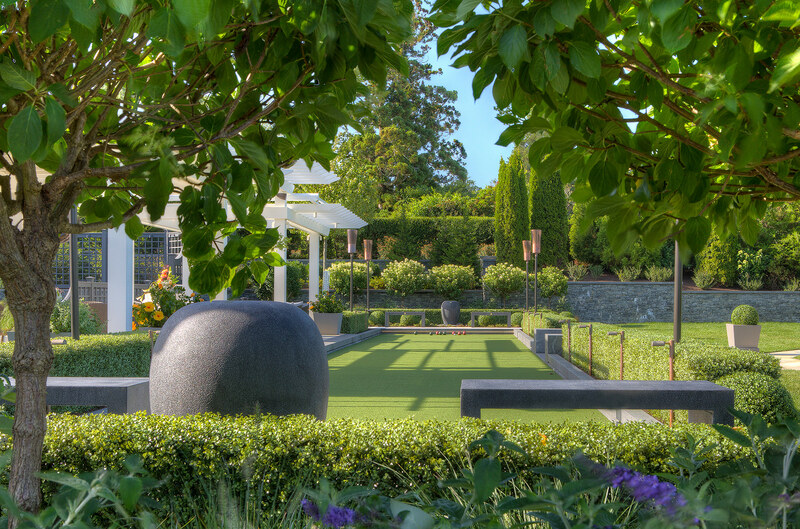 This project pushes the boundaries of conventional landscape design. 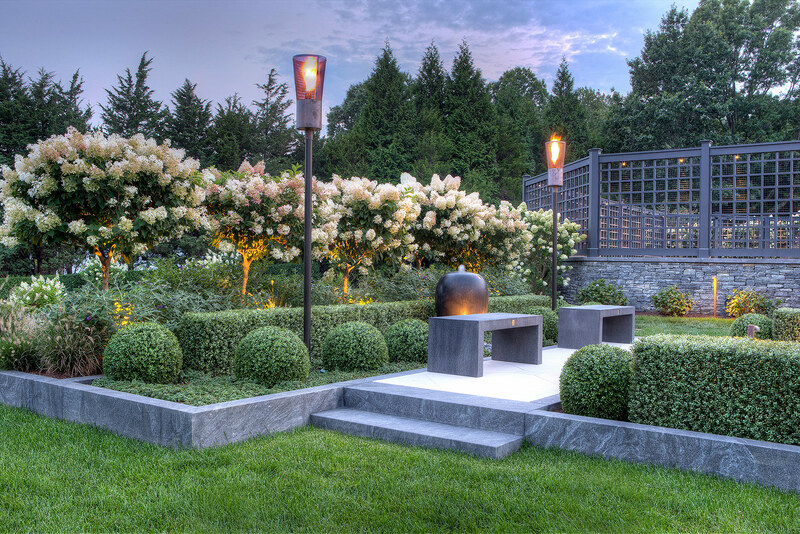 Custom stone and metal fabrications were created, including speaker covers, torches, firepit table, handrails, metal gates, latches, and fencing. 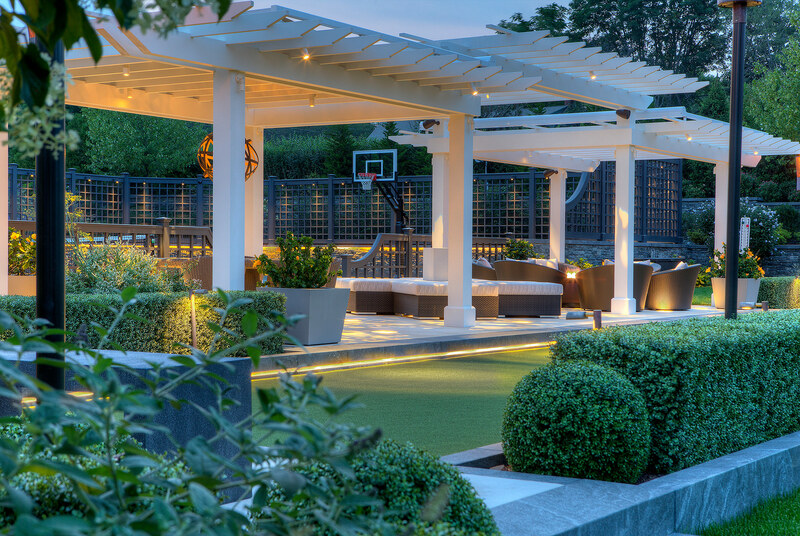 Lighting design includes illuminated glass pavers, theatrical projection lighting, LED lighting under the wall caps and along the edges of the bocce court, sculpture lighting, and landscape lighting. 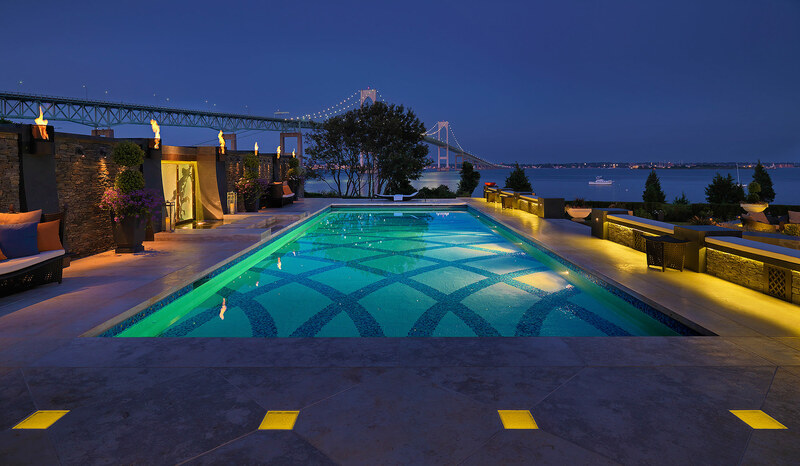 The bottom of the pool is decorated with handmade Italian glass tile in a radial pattern reflecting the arches of the nearby bridge. A fiber-optic light pattern in the pool floor recreates the constellations overhead the day the clients were married. In support of the clients’ love of art, we worked closely with glass and metal artists to add a highly creative layer to this site. Carved glass panels are the backdrop for three large waterfalls around the pool. Large cast bronze clam shells cover electrical controls for lighting and pool equipment. 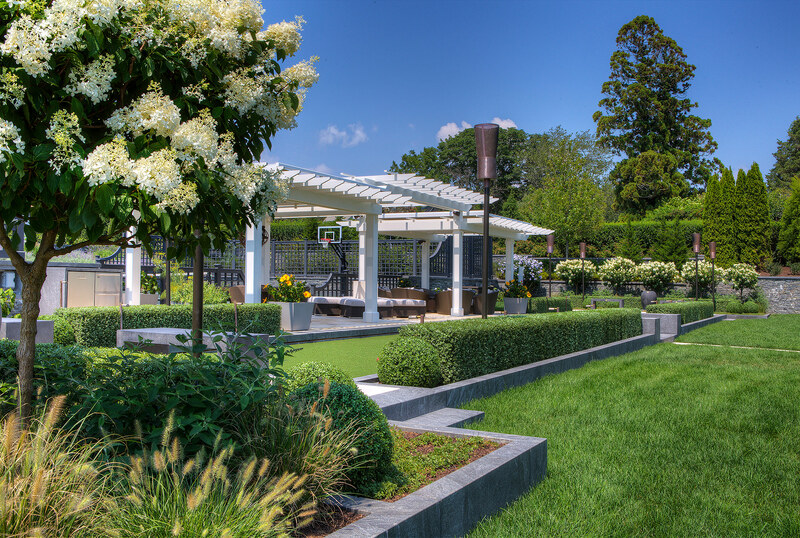 A sculpture from the clients’ personal collection is sited within the gardens above the tennis court. Stone features echo the rock outcroppings of the natural environment. 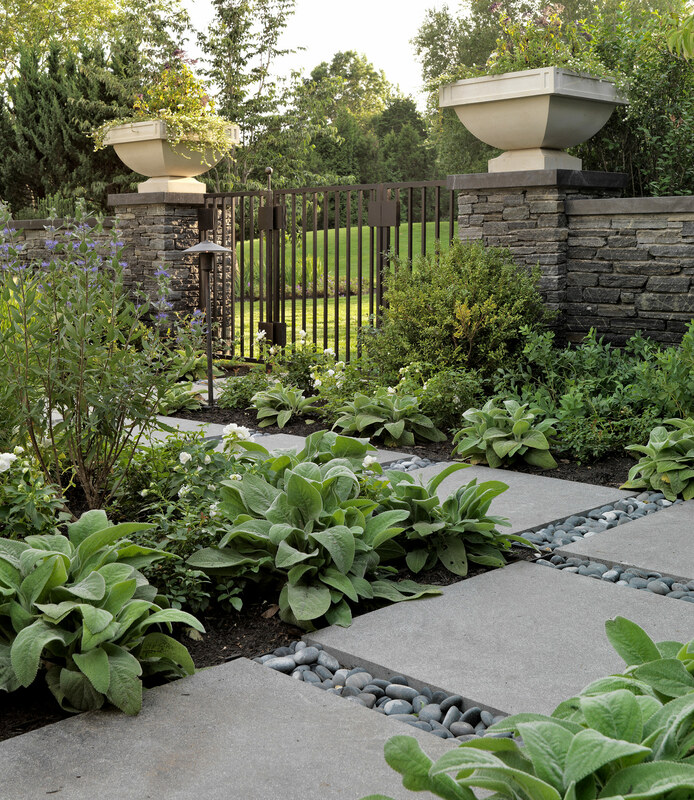 Fieldstone retaining walls create level areas on a sloping site. The monolithic, curving granite buttresses are a visual nod to the bridge’s structure. 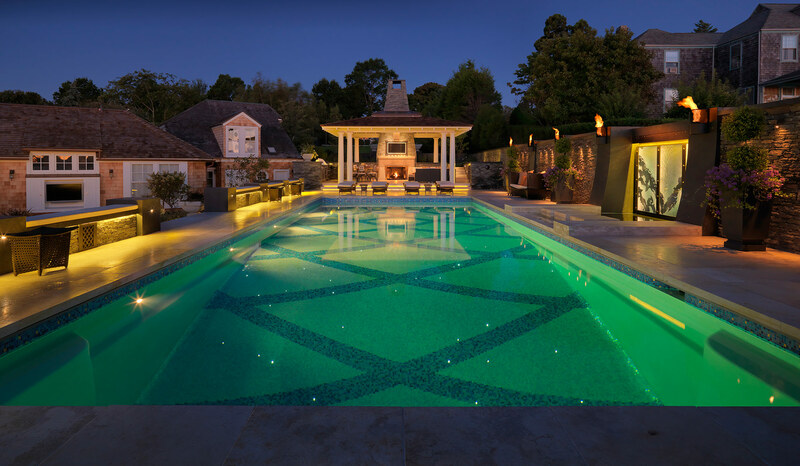 Limestone paving with custom lighting inserts provide a soft walking surface and dynamic nighttime illumination. 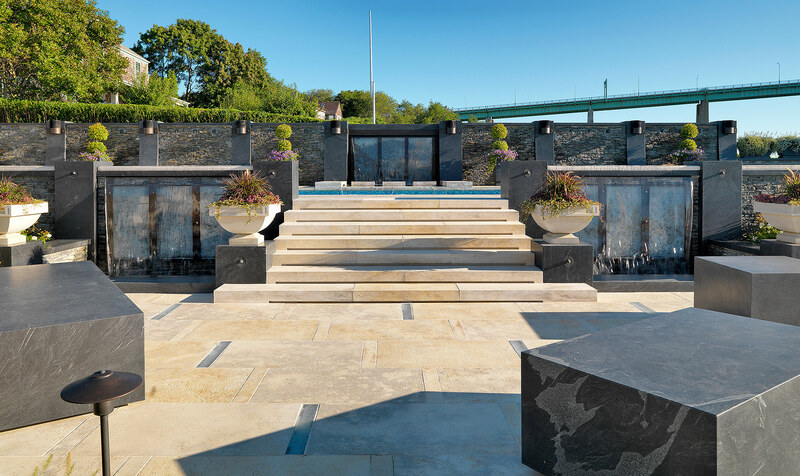 Black granite slabs function as sculptural seating, and retain the warmth of the sun into the evening. 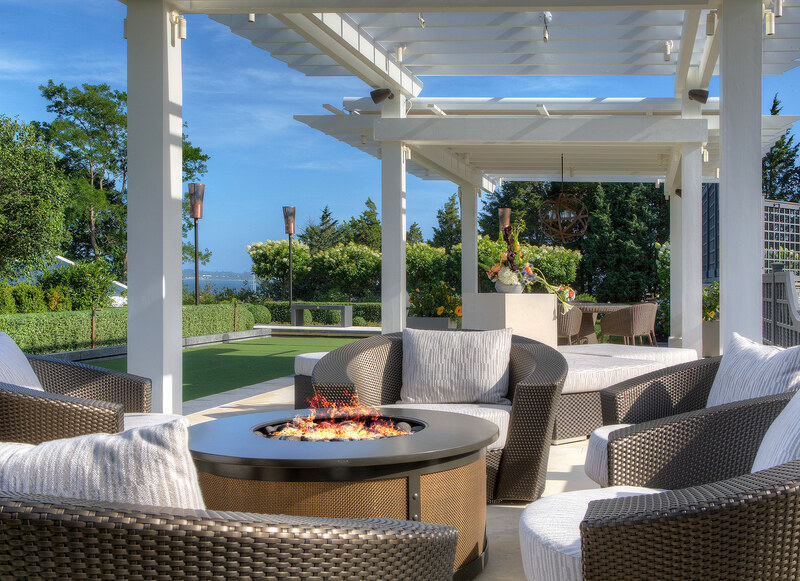 The pool pavilion and tennis court pergola create outdoor rooms for entertaining, and the fire features offer warmth and comfort on breezy nights. The soothing splash from the water fountain mitigates the sound of traffic from the bridge and creates a tranquil atmosphere. 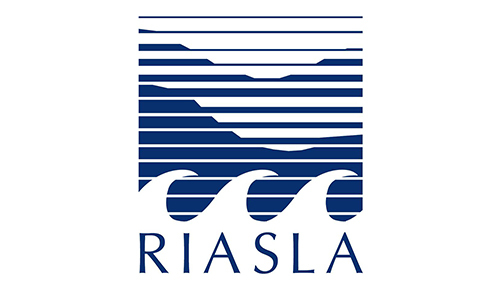 Plant material was selected for sustainability, summer color and resiliency to the frequently unforgiving coastline conditions. 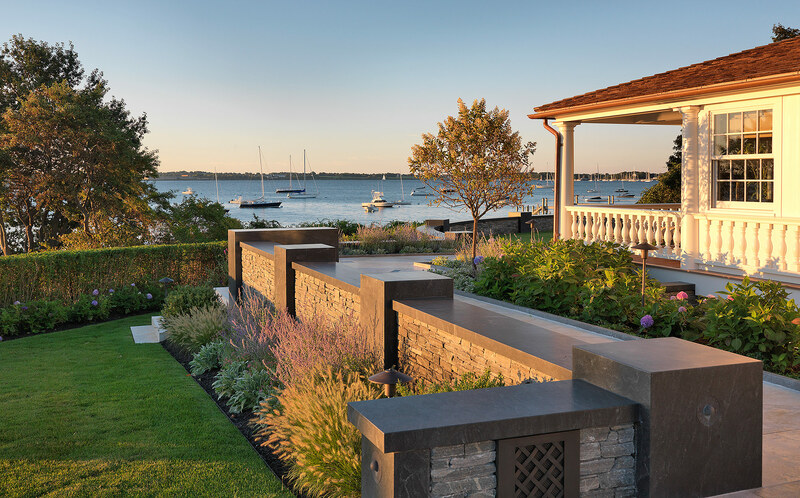 Shades of blue and ornamental grasses connect the landscape visually to its shoreline location. Native plants are used as the palette for the perimeter. 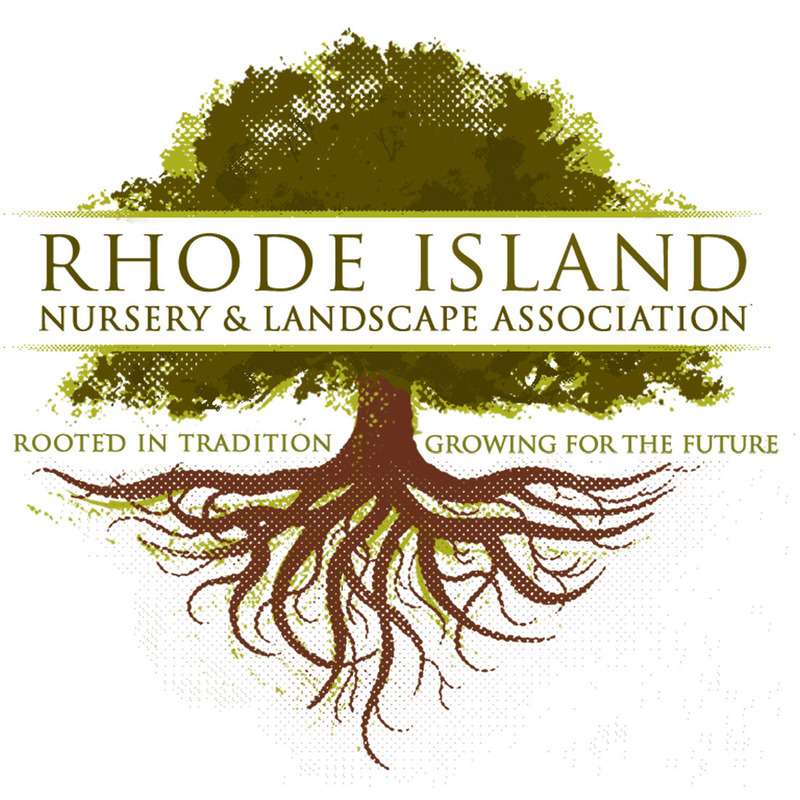 Color is added closer to the house through the use of flowering shrubs, perennials, annuals, succulents and tropicals in pots. 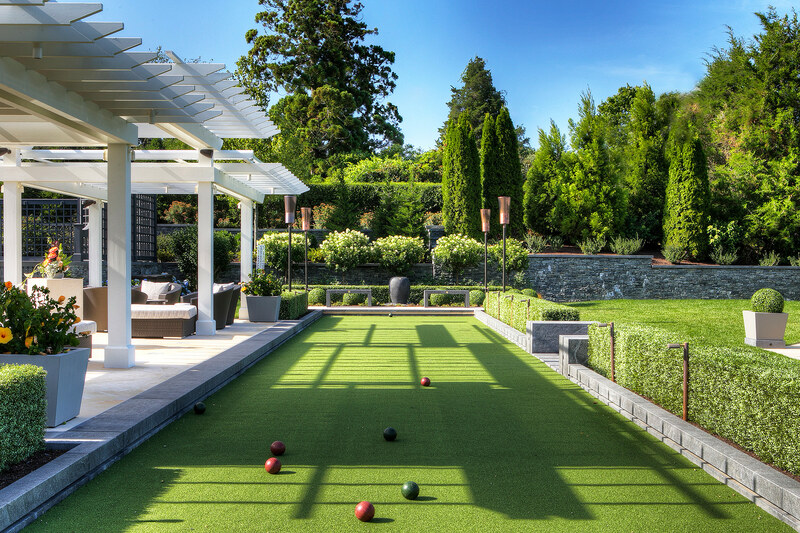 Artificial turf was selected for the bocce court, for low maintenance, durability and to keep the green palette around the tennis court. 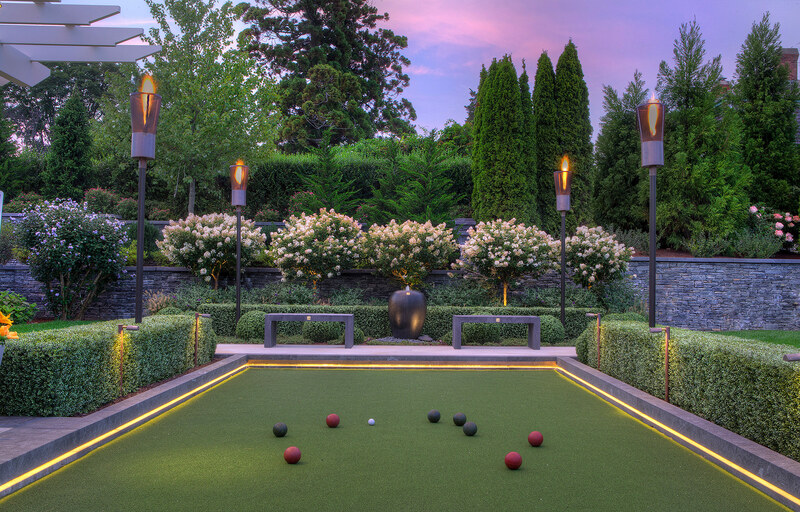 Due to the client’s expectation of camera-ready gardens, we also included artificial boxwood accents at the bocce court and in some planters. The results are surprising! INTERIOR DESIGNER/ FURNISHINGS: Carolina Tress Balsbaugh at Manuel deSantaren, Inc.